Posts tagged with "App Review"
This isn't necessarily a change of policy, but more an explicit clarification of something that's already been allowed. The Omni Group, for example, began switching its entire suite of apps in September 2016 to the same sales model: free downloads, with In-App Purchases for unlocking full functionality after 14-day trial periods. Since that time, however, very few apps have followed the same path – likely in part due to continued uncertainty regarding what's officially allowed. The updated review guidelines should lead to a welcome increase of paid up front apps transitioning to free downloads with In-App Purchases, thus enabling more ubiquitous free trials across the App Store. Over the last several weeks, a few different emoji-related App Review stories have been shared by developers on Twitter. Though it's common practice to use emoji throughout an app's interface, Apple has begun rejecting some apps for just this reason. Using an emoji as a core part of an app's UI, or in-game character seems to be a fairly clear overstepping of the mark, and now that Apple has begun enforcing this, I don't expect that side of things to change. It's understandable there is much confusion about this right now, especially as the Apple Color Emoji font until now has been treated by many as a font like any other. If...thought about as "a set of images created and owned by Apple", the terms for what seems reasonable do shift. Despite the lack of word from Apple on an official policy change, the signs don't look good. Apple owns the rights to its emoji designs, and there is currently no way for developers to license those designs, so we may begin seeing a lot less emoji use in apps soon. Just before the annual holiday shutdown of the App Store, Apple has revised its App Store Review Guidelines to address new App Store functionality like Pre-Orders and clarify or expand a handful of existing guidelines, including the creation of apps from templates and how ’loot boxes’ and VPNs should be handled. Below is a summary of the major changes to the Guidelines. To see all the changes, check out Rich Hong’s App Store Review Guidelines gist on GitHub. Ahead of the upcoming public releases of iOS 11 and watchOS 4 on September 19th and macOS High Sierra on September 25th, Apple has told developers via its developer website that App Store submissions are open. Apple has added scores of new features to its operating systems that developers can take advantage of to improve existing apps and create all-new ones that were impossible before the new APIs were introduced. Perhaps most anticipated are the additions to iOS that enable brand new features to the iPad like the dock, drag and drop, Split View enhancements, and much more. While the following list is not exhaustive, examples of appropriate subscriptions include: new game levels; episodic content; multi-player support; apps that offer consistent, substantive updates; access to large collections of, or continually updated, media content; software as a service (“SAAS”); and cloud support. The availability of subscriptions for apps that are ‘continually updated’ provides additional clarity to an issue that was hotly debated and discussed among developers since subscriptions were announced shortly before WWDC. The App Review Guidelines also include an entire section on stickers. Section 4.4.3 includes a link for making infringement claims and states that if you cannot back up your rights to content contained in stickers with documentation, your sticker packs and extensions will be removed from the App Store. Repeat violators risk having their developer accounts revoked. Apps integrating SiriKit should only sign up for intents they can handle without the support of an additional app and that users would expect from the stated functionality. For example, if your app is a meal planning app, you should not incorporate an intent to start a workout, even if the app shares integration with a fitness app. This guideline seems to be designed to avoid confusion that could be created by an app without clear SiriKit functionality accessing SiriKit. Existing customers will still have access to apps removed from the App Store. In addition, Apple announced in an email to developers that going forward, app names will be limited to 50 characters. Apple explained that long app names, which developers use to try to influence search results, provide no value for customers, particularly because they are too long to display in full on the App Store. Eight years and over two million apps later, the App Store is long overdue for a cleanup. Abandoned and broken apps create a real discovery problem for customers. We are well past the time when the number of apps served as meaningful bragging rights for Apple keynotes. 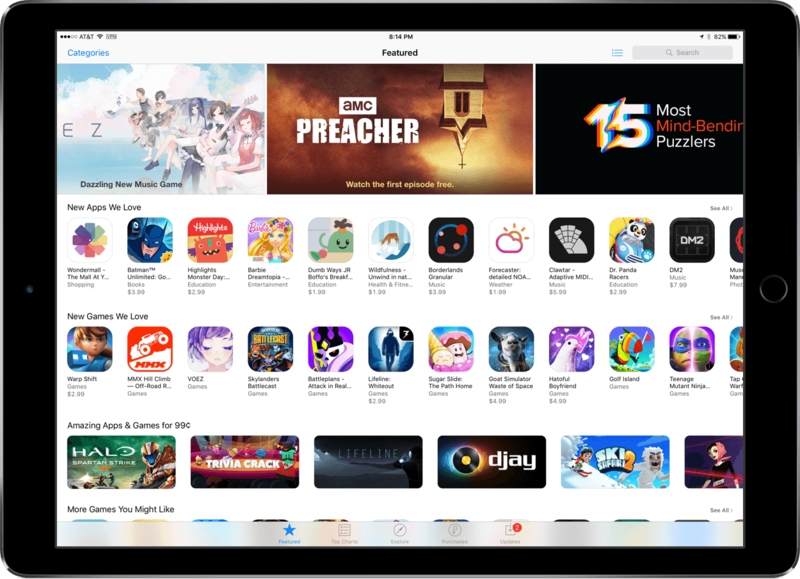 The directness in tone and relatively short time frame given to developers to make changes to apps sends a clear message – Apple is serious about cleaning up the App Store. Developers with neglected apps had better pay attention if they want to remain on the App Store. As many have noted this month, including Bloomberg, App Review has been processing app updates at a much quicker rate than usual. 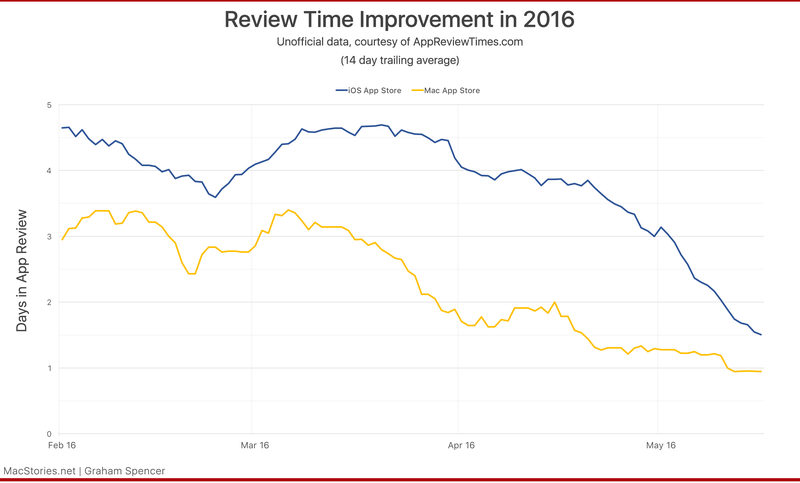 In the past week the average time for an iOS app to be approved by App Review has fallen to just 1.5 days. Apple itself doesn't publish times, but there is unofficial crowd-sourced data at AppReviewTimes.com. 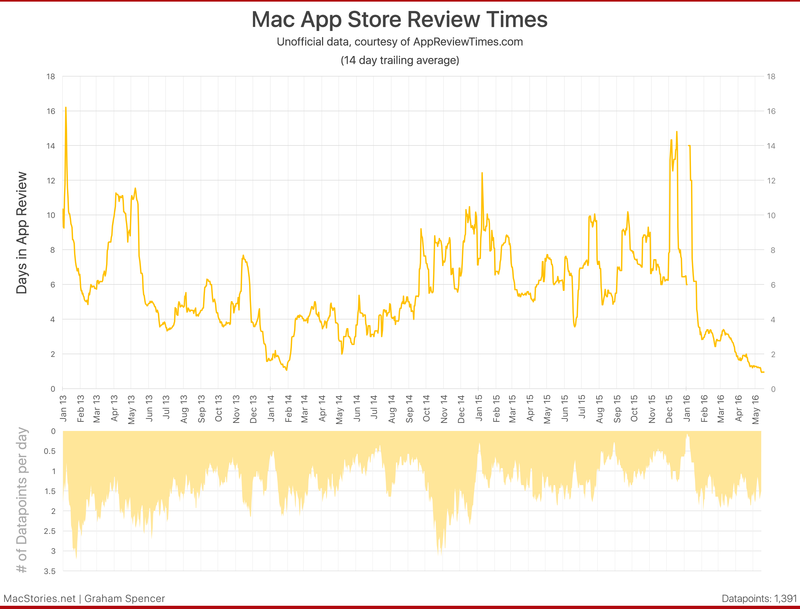 Dave Verwer of AppReviewTimes.com was kind enough to share the raw data with MacStories, and we produced the above and below charts which provide some visual context and demonstrate just how out of the ordinary the recent improvement in App Review time is. 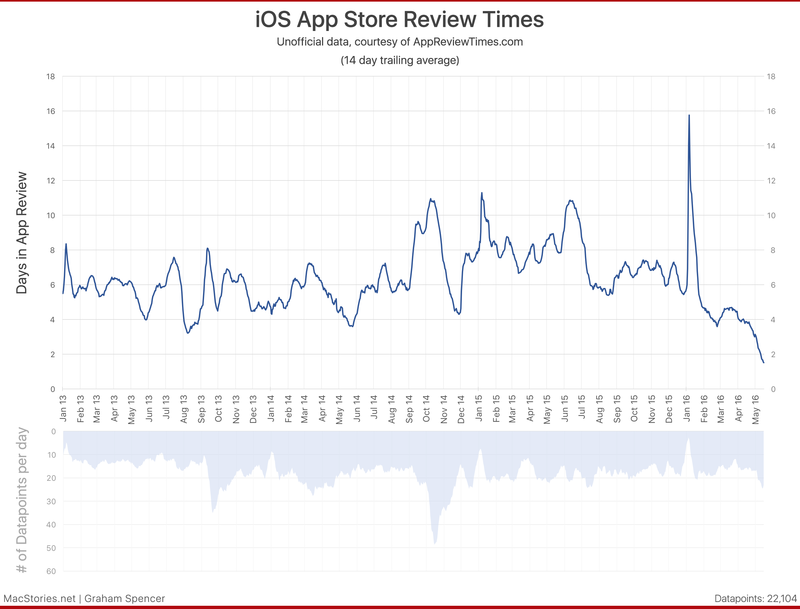 It is too early to say conclusively, but given the extent of the reduction (and the sudden nature of it), I think it is fairly safe to guess that Apple has made some internal changes in order to improve the speed of App Review. Earlier this year we published an extensive survey which detailed a number of frustrations that developers had with App Review, and suggestions for how Apple could improve App Review. At the top of that list of developer frustrations was the slow speed of App Review, with 78% saying it was bad or terrible.